Phonics and literacy expert Wiley Blevins offers a fun activity that adds the element of vocabulary to word building. After students have had multiple exposures to targeted phonics skill words, this activity gives them the opportunity to expand their vocabularies by answering clues to determine how to make a new word. 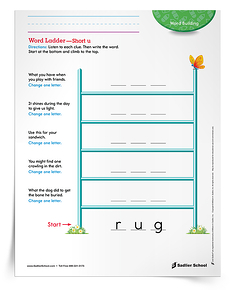 Fill out the form to download the Word Ladder—Short u Activity now.